Thinking of investing in your golf game? Make sure you visit one of GolfBC's professional custom club fitters before your next big purchase. Every golfer has a unique swing, body shape and size; taking the time to have your clubs custom fit takes some of the guess work out of making a decision on which clubs are best for you. GolfBC's world class practice facilities provide the ideal outdoor environment for club fitting as ultimately ball flight is one of the key factors in determining the right club or set for you. Ball Flight Analysis - The most important step in the process is ball flight analysis. During this step, the fitter will utilize a variety of clubs with slightly different specifications to isolate each fitting variable and determine the combination of club length, shaft type and flex, club model and grip size that gives you the best opportunity to achieve your desired ball flight. Monitoring Performance - Since your swing may change over time, the final step, Monitoring Performance, is ongoing. Periodic evaluation of your ball flight may reveal undesirable shot patterns with a group of irons or the entire set. A swing change, club adjustment or a combination of both may be necessary to resolve or eliminate these patterns. 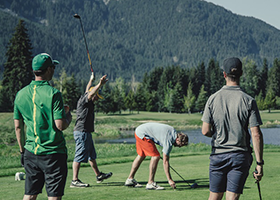 At GolfBC the custom club fitting fees may be waived when you make your purchase at the course where you were fit, contact your local GolfBC golf shop for more details. Make GolfBC your first choice for custom fitting! Call your local GolfBC golf shop to make an appointment.